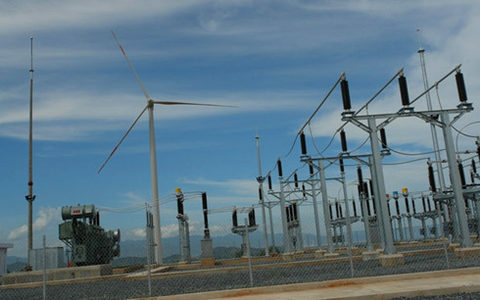 Binh Thuan Wind Power Company said the Phu Lac plant has 12 turbines with a combined output of 24 megawatts, local media reported. The project costs more than VND1 trillion ($48 million), including a $37 million grant from German government development bank KfW. Vietnam is operating three other wind power plants including two in Binh Thuan and another in the Mekong Delta’s Bac Lieu Province. The country now depends on thermal and hydropower for almost all of its electricity demand, while wind power has only contributed 0.3 percent, according to a report this week from state-owned utility Electricity of Vietnam. Thermal power plants make up more than half of the total generation, and among them, coal-fired plants account for 34 percent. The country has been taking steps to develop cleaner and more sustainable energy sources. It plans to have 800 MW of wind power by 2020, compared to 140 MW as of March this year, according to a post on the government's website. Investors have committed to more than 45 wind powerprojects to generate more than 4,800 MW in total, but most of them are still on paper. Binh Thuan alone has 16. Various media reports suggest that investors in general are reluctant to develop wind power projects because prices in Vietnam are not high enough to cover the costs. In Vietnam, state-owned Electricity of Vietnam, which controls the national grid, reportedly pays 7.8 U.S. cents or VND1,731 per kilowatt-hour for wind power, much lower than the rates in China, Japan and the Philippines. Binh Thuan Province's Wind Power Association has requested the government to raise prices to 12 cents in 2017.